Roligheten. What a brilliant last name! I can’t help but to explore it a bit. Roligheten is the last name of saxophonist André, who’s album Homegrown I’ve spent some time listening to, and which you’re about to learn more about. But Roligheten is a peculiar name for me coming from André’s neighboring country Sweden. Roligheten is not only the name of a very small village in Sweden, with about 85 inhabitants. It’s also a village in Norway, in the Telemark region. (Telemark by the way is known to me as a form of alpine skiing with a free heel, as opposed to the most common ways of alpine skiing where the whole ski boot is fixed to the binding of the ski. It looks very elegant and free when you see a skilled telemark skier in the alps). Roligheten as a noun, in Swedish, is a form of witticism or fun joke. But there’s more. Rolig happens to be the Swedish word for funny, where as in Norway AND Denmark the word rolig means calm. Now, let’s see if we, in the music of Roligheten, can find music that’s free from bindings but which is elegant, witty, funny and calm. Roligheten Quartet consists of André Roligheten (‘European Jazz Orchestra’, ‘Team Hegdal’, ‘Gard Nilssen´s Acoustic Unity’) on tenor and soprano saxophone and bass clarinet, Adrian Løseth Waade (‘Trondheim Jazz Orchestra’, ‘Bone Machine’) on violin, Jon Rune Strøm (‘Paal Nilssen-Love Large Unit’, ‘Nu Ensemble’, ‘Frode Gjerstad Trio’ and many other constellations) on double bass and Erik Nylander (‘Ola Kvernberg Trio’ to mention one, and heard on the very recent Honest John album International Breakthrough) on drums and percussion. Looking only at the titles of songs on this album and musicians involved I felt that this could go in any direction. I must say I was intrigued to hear a violinist playing in a song called Telemark Tango on a jazz (supposedly) album. Would they go with the fiery Argentinian version or the melancholy found in ‘Finnish tango’, or something in between? I was pleasantly surprised throughout the album. It starts off with ‘Bratsberg Boogie’. A mystic and a bit Egyptian-like melody begins the song, but suddenly it stops and the scene changes. I had to listen very closely to try and understand what was going on. Was this a second theme? A variation? It was almost like the instruments were dispersed and then called to come together again. Once together, Nylander leads the way and together they start adding in structure. But they keep adding layer after layer and you can never settle and relax, you’ll get lost. There’s lots going on within the song; between individual musicians and as a quartet. I try to hold on to something, but Roligheten keeps pushing me around refuses to settle. In ‘Nidkjær’ (Zealous), which serves very well as an intermezzo between ‘Bratsberg Boogie’ and ‘Telemark Tango’, we’re given beats of bass, violin and bass drum in different tempos for 3 minutes. It feels like the quartet is gearing up for the tango. …and indeed. ‘Telemark Tango’ allows the now well rested quartet to spread its wings. But there’s more inside the tango. Roligheten weaves in what sounds like short middle-east influenced melodies in small portions with Nylander keeping the tango going. Having the violin doing these excursions is a clever move rather than having Roligheten doing it. It also adds to the ‘homegrown’ feeling (pun intended). ‘Syvsover’ paints a fragile picture. Slow paced violin and sax telling a sad story at first, but there is a couple of bursts of energy from Roligheten challenging the status quo, but I’m left alone in the end. ‘Saft Suse’ (I’m told this is a seldom heard powerful expression, not like a curse word – but almost. Norwegians, feel free to help out here). Happy to hear André Roligheten play front and center in this song. He’s got a meaty tone and the contrasts with the violin makes me appreciate this song even more. The entire album continues like this. Not jaw-dropping surprises, but rather subtle and elegant details hidden within the songs and melodies. 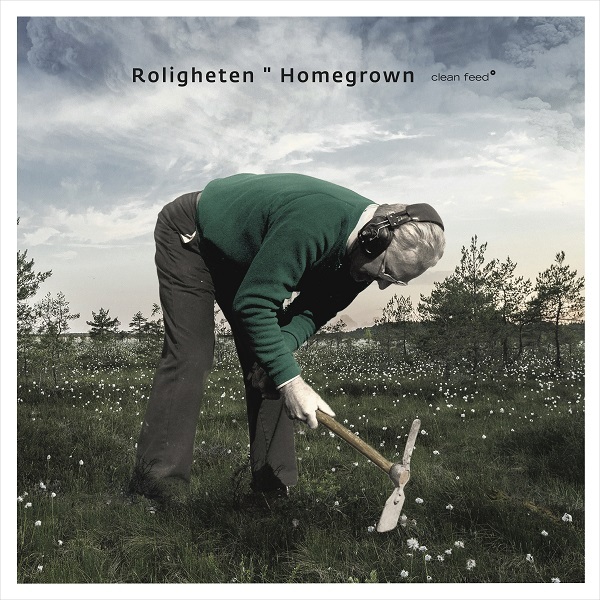 I don’t think Roligheten wants to push free jazz boundaries with Homegrown, but this certainly is elegant, it’s funny and witty at times but I’d say most importantly it’s telling multiple stories within each song. Keep this album running for a couple of hours and you’ll start hearing the nuances.